I’ve always said, “Plant in your veggie garden what you love to eat”. So go ahead, plant veggies that you’ll be excited to eat. It doesn’t do any good to plant the seeds and work hard all season to produce a crop that makes your family say, mehhhh…. Although I picked other veggies to add with our supper tonight, THIS is my favorite of the day’s samplings – not only the coveted first ripe home-grown tomatoes of the season but the makings of homemade fresh salsa tonight: Tomatoes, purple onion, garlic and jalapenos. Proof positive that you can eat your veggies and LOVE it! Now folks, you don’t get any more fresh than straight from the garden! Although I assemble my pico/salsa the old fashioned way with a knife and cutting board, it still takes no time for the veggies to get chopped or minced and blissfully marinating in the fridge awaiting squeals of delight from the family. Now let’s be honest, any time you can get your family to get excited about eating their veggies it’s a good day, right? I don’t really have a recipe per se,because I make it slightly different each time based on what I’m in the mood for and the output of the garden. The beauty here is that you can add the veggies in the proportions you enjoy. Like it spicy? Add tons of jalapenos. Are you a garlic fiend? Throw in more garlic cloves. Do purple onions make you sing? Chop of a whole onion and throw it in there. As I’ve said many times before, if a recipe isn’t delicious, quick and ADAPTABLE it doesn’t last long here at the ranch. Here’s the way to put it all together: Chop the tomatoes, jalapeno and onion in the proportion you enjoy and place in a bowl. Mince a clove or two of garlic and add it to the bowl as well. A quick squeeze of lime juice gives just the right zest. Sometimes I add a sprinkle of salt and if I have cilantro I’ll chop some of that and mix it in as well. After it’s all mixed together put the bowl in the fridge for an hour or more to meld the flavors. Ole’! This entry was posted in Blog Posts and tagged Cooking, Gardening, Make-It-Yourself, Recipes, Summer on June 21, 2013 by Texas Homesteader. YUM! Love that you added garlic to this! Oh, and yes, purple onions do make me sing 🙂 Thanks for linking up on Simply Natural Saturdays! I love a good salsa! I’d love to make some. You’ve reminded my I need to get off the computer and water tomatoes! Enjoy your week. We’re still waiting for our tomatoes to grow 🙁 Hopefully when they finally come in we can make some awesome salsa. Thanks so much for sharing on Green Thumb Thursday – except that now I’m drooling! We hope you’ll join us this week http://homesteadlady.com/green-thumb-thursday-72414/! I love homemade salsa, especially from the garden. I am waiting for my tomatoes to get red and will definitely be making some! I didn’t plant any tomatoes this summer, thinking it would be like any other summer and that they would just FRY in the North Texas heat. And what do you know…. it’s in the 60’s this morning and we’ve just had 3 inches of rain. Oh well! I know how you feel about blogging time, I’ve finally gotten back to the blog and will try to keep it up after I go back to work in a few weeks. Your salsa looks yummy. I love the chunkiness. Can’t wait to try your salsa receipe. Have you ever canned it? If so how did you do it? Thanks from one Texas girl to another! Love homemade salsa. It’s so much than the kind you can buy in a store. Thank you for linking at the In and Out of the Kitchen Link Party. Hope to see you again next week. It’s always a sweet pleasure to visit your blog! I love the notion of using what you have and going with what sounds good at the moment. And yes, if it get’s people excited about eating veggies – that’s a winner in my book too. Thanks for sharing the gorgeous veggies from your garden. Have a beautiful day! 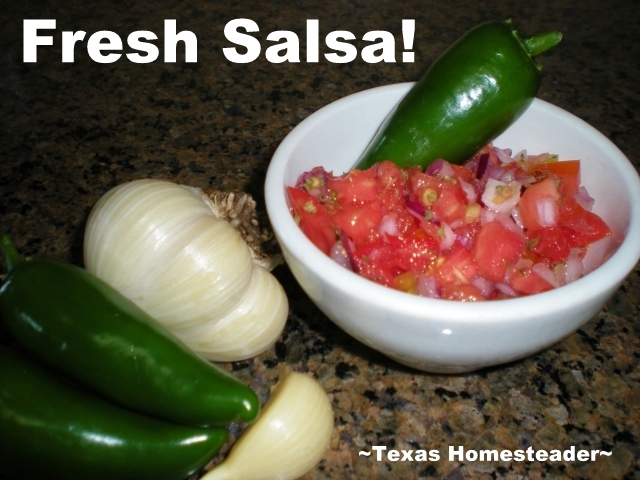 Without question, fresh made salsa is so much better than out of a plastic jar! I cook most of my food from scratch, but I’ve never made my own salsa. For some reason, peppers scare me. You’ve just about got me convinced to give it a try. I do know how much I love fresh salsa. I think it’s time for me to step out of my comfort zone…………. I love homemade fresh salsa. 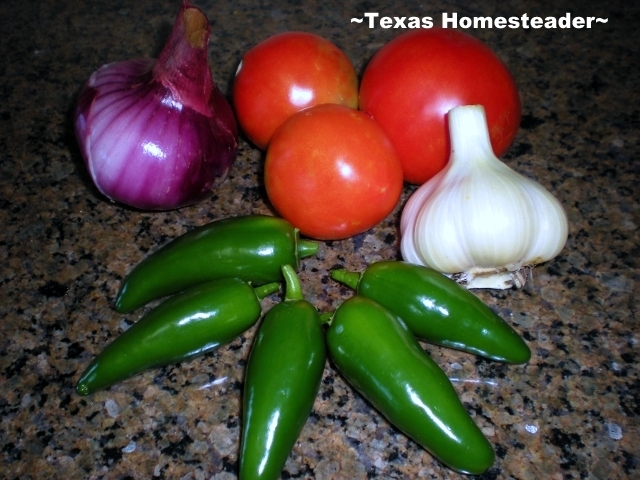 We grow lots of tomatoes and peppers in our garden each year and much of it goes into salsa. Nice post! Visiting here from the Get Fit Friday blog hop. I love homemade salsa! I’m a terrible gardener, but thankfully our local farmers market has a great selection of fresh veggies. My husband makes his special salsa recipe, jars it up and gives it out to our friends. A cute little mason jar of salsa makes a nice impromptu gift! Homegrown tomatoes are one of my favorite things. And I love making salsa. Thank you for linking up at Wildrafting Wednesday. I’ll be jumping into the world of vegetable gardening next year and I can’t wait for things like homemade salsa!! We have two raised beds which we have 8 tomato plants and herbs. This year we also are trying to grow some onions and in the fall we are going to plant garlic.